Please note that we do not accept bookings involving children aged under 10 - this is due to the irreplaceable nature of some of the items scattered about the cottage. 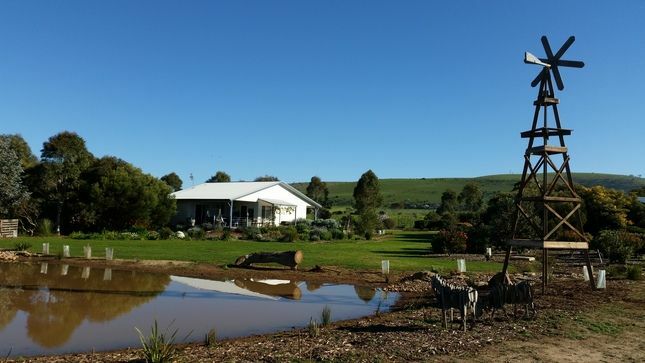 Set on small acreage, Very Vintage offers a quiet location to get away from it all whilst remaining very close to Port Elliot and Victor Harbor. A secluded and private location offering views to nearby Encounter Bay with a backdrop of hills. A two bedroom themed cottage offering comfort and privacy. Not suitable for young children (aged under 10). All cottages supplied with linen and full cooking facilities. Discount vouchers to local eateries. Very Vintage offers the opportunity to just put your feet up and recharge the batteries. Indulge in a spa, sit on the deck and just read a book or watch the cheeky little wrens as they flit about the garden. Sip on a glass of wine and just relax. The beach is 2 minutes drive away - go for that late evening or early morning stroll. Why eat at home when you can eat at any of the local high quality local restaurants. Very Vintage has been set up as a themed cottage - utilising restored items. Many of the pieces have a history and have come to us from family and friends. Relive some of the past - "I remember ..... ..... in grandma's place". A wonderful location. Peaceful with a beautiful garden full of birds. Easy access to the beach and Port Elliot. Very comfortable and clean. Highly recommend it. Thank you Judy and David We are glad that you enjoyed your stay - you are welcome back in the future. We are hoping that as the garden continues to grow and develop that there will be an even greater variety of bird life. Thoroughly enjoyable home away from home. It took me back to my childhood exploring all the antiques reminded me of my stays with my grandparents when I was small. We felt so relaxed & comfy we did not want to leave. Definitely will be returning more than once. It's away from the hustle & bustle but not to far to all the necessities. Even comes with local wildlife at no extra cost. Thank you for your review Wendy. We are glad that you enjoyed your stay in our "home away from home". The aim of the decor in Vintage is to rekindle some of those memories. You are welcome back - perhaps in the warmer months since the weather was not favourable during your stay. We thoroughly enjoyed our stay at 'Very Vintage' cottage. It's only 2 minutes drive from the centre of Port Elliott and located in lovely rural setting. The owners have put in a huge effort both inside and outside the cottage. The garden is just stunning and breakfast on the back deck watching the wrens and honey-eaters was a highlight of our trip. This cottage is great value for people looking for something a little different in a beautiful, quiet setting. Thank you Kylie. We are glad that you enjoyed your stay so much. Agreed breakfast on the deck can be very entertaining with the cheeky wrens often putting on a show. We welcome you back despite the long distance involved. Very Vintage suited us very well. It was well equipped and the decor was very attractive. The surrounding plantings made the views really attractive. Everything worked, the kitchen was very well equipped and the spa pure luxury. The silence at night was a delight. We would certainly stay again. We are glad that you enjoyed your stay. As the gardens grow they offer that little bit more of an experience to wander through and get closer to nature. We are glad that you enjoyed your stay Jenny. Pleased that you also enjoyed the decor - many people comment on the memories that come back due to the vintage items scattered through the cottage. The wrens are a real feature - they are so cheeky! Loved our stay at Very Vintage!! We enjoyed our stay at Very Vintage. It was so relaxing and had a nice country feel even though it was close to Port Elliott. It was very clean and comfortable. Will definitely be staying there again!